Firestone, one of the premier automobile tire suppliers in the world, was very active in racing across America. For years they had their racing headquarters set up at the Indianapolis Motor Speedway and were in fact the key supplier of race tires for the annual Indy field. Historically, Firestone had done its Indy car race tire development by renting cars from various race teams on a per day basis for tire testing. 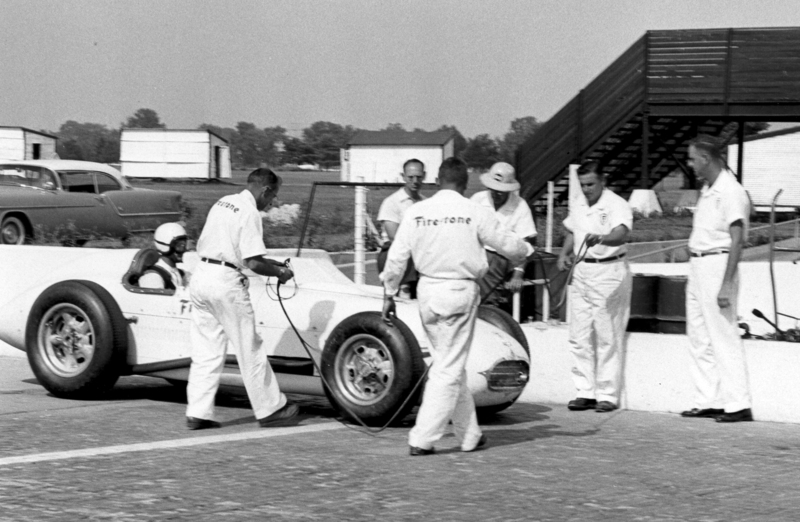 In 1954, Firestone decided to acquire a new Indy car to be used solely for tire testing. They purchased a Kurtis-Kraft KK500A, chassis No. 379-54 and had it shipped to Indianapolis. 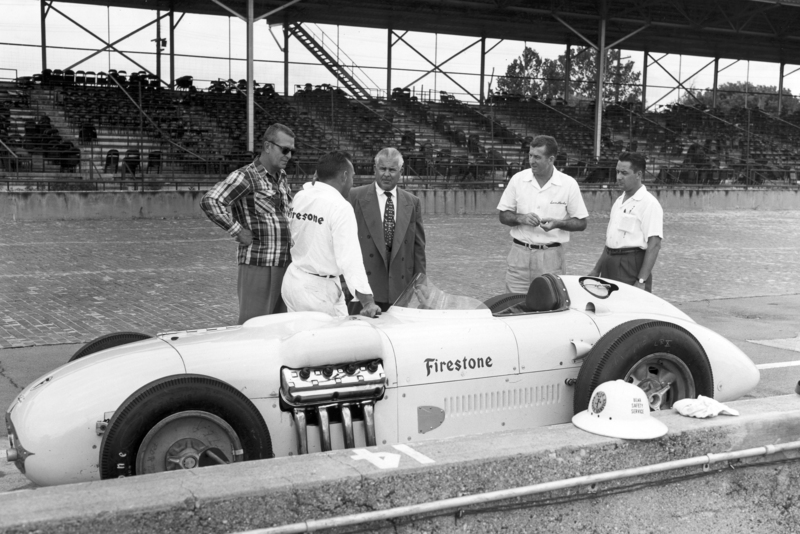 During this period, Firestone also forged an alliance with the Chrysler Corporation, which at the time was trying to develop a successful Indy 500 racing engine. Then the brand new Kurtis chassis and a brand new Chrysler 331 cubic inch A311 Hemi engine were shipped individually to Indianapolis to be used as the new test car. It was at this time that Firestone’s Bill McCrary looked up Ray Nichels. 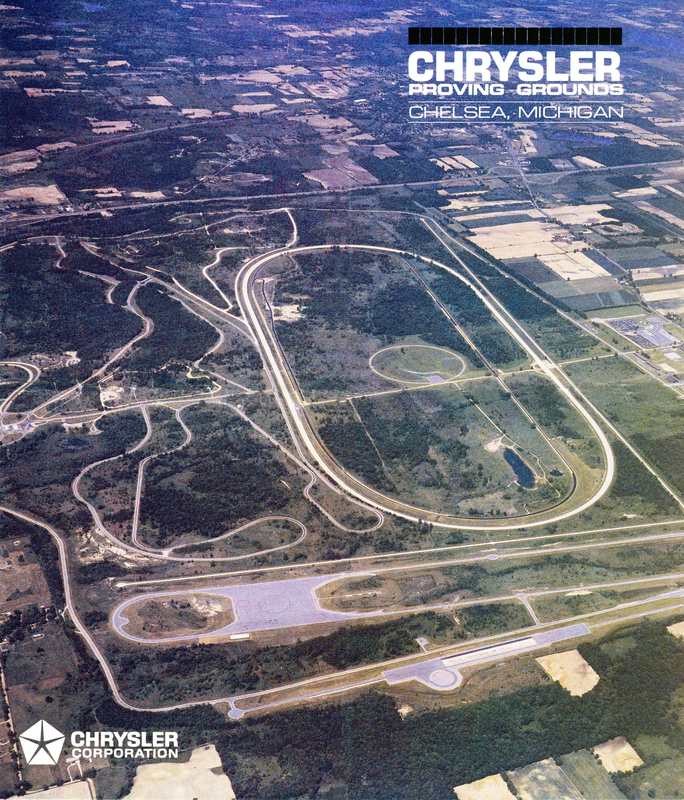 Chrysler and Firestone were about to stage a major public relations event on June 16th at the newly constructed Chrysler Corporation Proving Grounds in Chelsea, Michigan, not far from Detroit. Chrysler invited the top four finishers of the 1954 Indianapolis 500 to bring their cars and race teams to Chelsea and be the first to establish benchmark speed records at the proving grounds complex. Nichels went to work and was able to get the car somewhat assembled and shipped to Chelsea. Once at the proving grounds he made the car presentable, and when June 16th rolled around, the Firestone display with the new Kurtis chassis and Chrysler engine looked quite impressive. As part of the day-long program introducing the facility to over 600 members of the press, the four top Indy 500 finishers, Bill Vukovich, Jimmy Bryan, Jack McGrath, and Troy Ruttman, took turns putting their Offy powered Indy cars through the paces on the vast 4.7 mile oval track that was the centerpiece of the world’s largest (4,000 acres) and most modern automobile proving grounds. It was McGrath who took the day’s top honors, setting a new closed-course world speed record of 179.386 miles per hour. With that, Nichels went to work. He stayed at the Chrysler Chelsea Proving Grounds to get the job done. In an effort not to upset members of the auto workers union, Nichels worked on the car in a shed adjacent to the track. Toiling day and night with the help of two engineers from the Firestone staff, he completed the job. On June 29th, Ray took the newly assembled Chrysler Hemi powered Kurtis-Kraft roadster out on the Chelsea oval. The first run was in traffic to check for wheel stability and oil leaks. Chrysler staff then shut down their testing on the track and gave Ray the entire track to put the car through its paces. Not running hard at all, Ray was clocked at 165 mph. With that, he put the Kurtis in for the night and waited for the arrival of the driver that Firestone had hired to pilot the car on the following morning. None other than defending AAA National driving champ and Nichels’ buddy Sam Hanks was the chauffeur hired for the task.